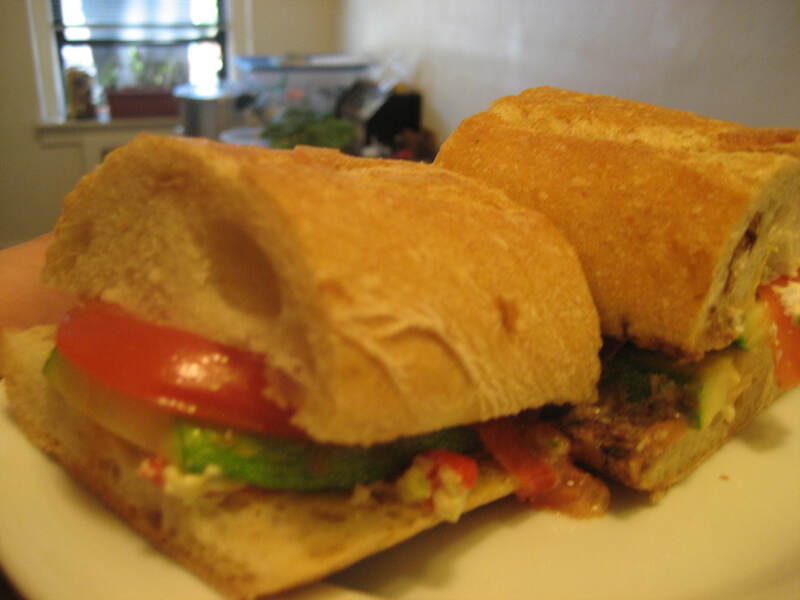 Grilled veggie sandwiches are a staple in our home. Generally I’ll grill a bit of what’s in season (squash, peppers, eggplant, mushrooms…you get the idea…), put it on a baguette, add some oil, balsamic vinegar and fresh mozzarella, and voila–Instant sandwich goodness! This week, in celebration of Eat Drink Local Week, I mixed it up a little bit. One of the featured ingredients for this week is goat, in any form. I prefer my goat in cheese form so decided to try a little goat cheese in lieu of mozzarella. 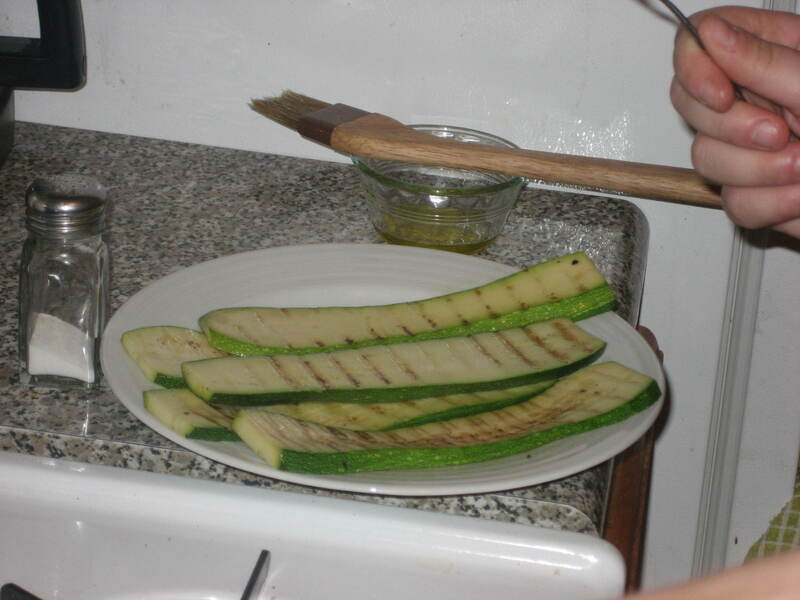 I picked up a fresh baguette from my FAVORITE baker, Bread Alone, topped it with grilled zucchini and tomatoes and drizzled it with balsamic vinegar. For the cheese, I picked up some roasted red pepper-pesto goat cheese from Lynnhaven while I was at the Grand Army Plaza Greenmarket. The results? Absolutely Amazing! And so quick too! 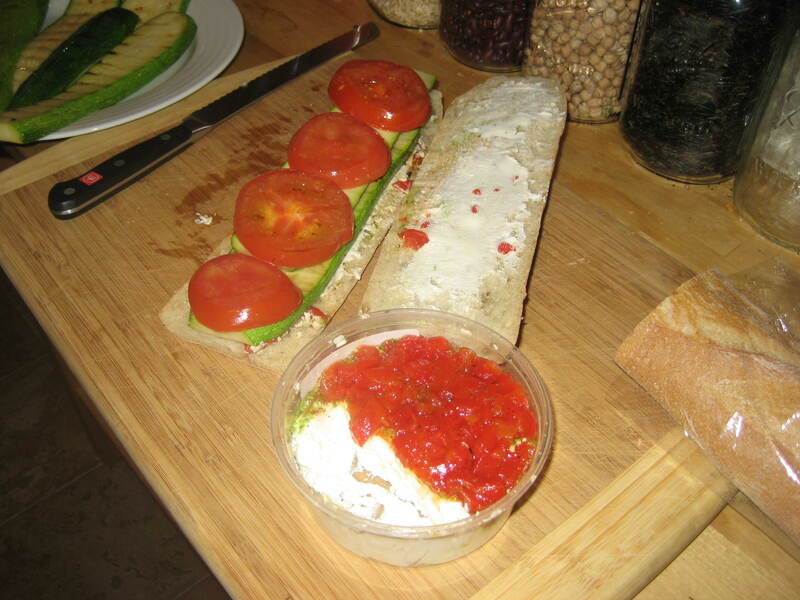 The next day toasted the rest of the baguette, cut it into small rounds and spread it with the rest of the goat cheese we had left over. Although, full disclosure, I could have easily just eaten the cheese alone straight off the knife. 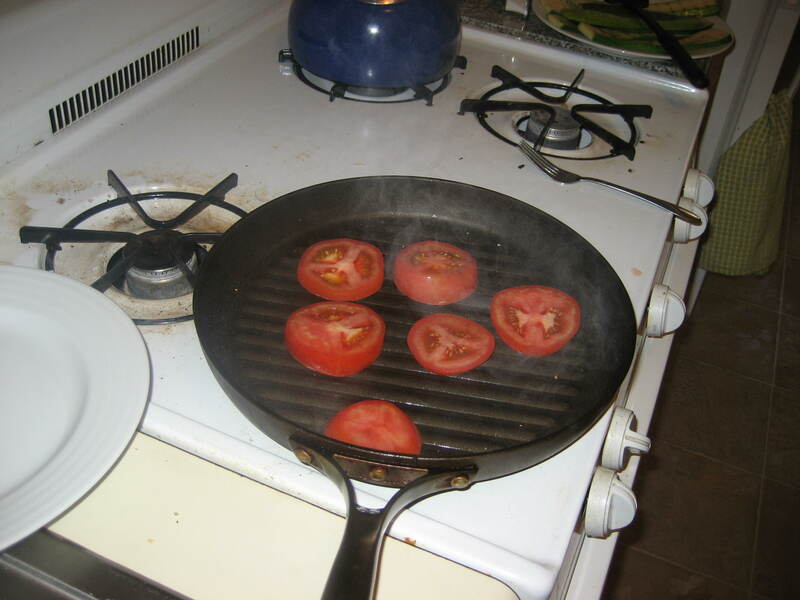 Mmm…look at those tomatoes sizzle! PS. 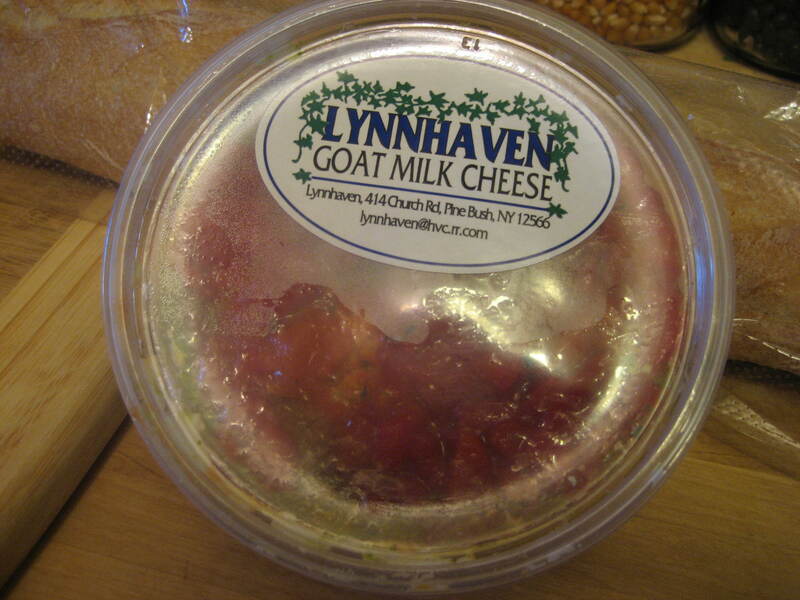 This was my first time trying Lynnhaven’s goat cheese but certainly not the last. I was trying to stay within a budget during my market trip, not to mention the fact that we were traveling and wanted to keep our food inventory low, so I restrained myself…this time. Top of my list for next time? Honey lavender goat cheese, slightly sweet and probably perfect on toast or scones for breakfast, and marinated goat cheese with sun dried tomatoes, honestly they looked just like mini balls of mozzarella. Can’t wait! Roasted red pepper pesto goat cheese–AMAZING!